The default length for usernames is 32 characters. The trailing $ symbol is permitted for Samba 3.x machine support. Any system limits — such as starting a username with a number on Unix systems — apply to the usernames in IdM. Usernames are case insensitive when they are created, meaning that any case letter can be entered but case is ignored when the username is saved. Username are automatically normalized to be all lower case, even if the user is created with mixed case or upper case letters. Open the Identity tab, and select the Users subtab. Click the Add link at the top of the users list. Fill in the user's first and last names. The user login (UID) is automatically generated based on the user's full name, but this can be set manually by clicking the Optional field link. Usernames are case insensitive when they are created, meaning that case is ignored. Username are automatically normalized to be all lower case, even if the user is created with mixed case or upper case letters. Click the Add and Edit button to go directly to the expanded entry page and fill in more attribute information, as in Section 9.2.3.1, “From the Web UI”. The user entry is created with some basic information already filled in, based on the given user information and the user entry template. New user entries are added with the user-add command. Attributes (listed in Table 9.2, “Default Identity Management User Attributes”) can be added to the entry with specific values or the command can be run with no arguments. Any of the user attributes can be passed with the command. This will either set values for optional attributes or override the default values for default attributes. When a user is created without specifying a UID or GID number, then the user account is automatically assigned an ID number that is next available in the server or replica range. (Number ranges are described more in Section 9.9, “Managing Unique UID and GID Number Assignments”.) This means that a user always has a unique number for its UID number and, if configured, for its private group. If a number is manually assigned to a user entry, the server does not validate that the uidNumber is unique. It will allow duplicate IDs; this is expected (though discouraged) behavior for POSIX entries. Click the name of the user to edit. There are a number of different types of attributes that can be edited for the user. All of the default attributes are listed in Table 9.2, “Default Identity Management User Attributes”. 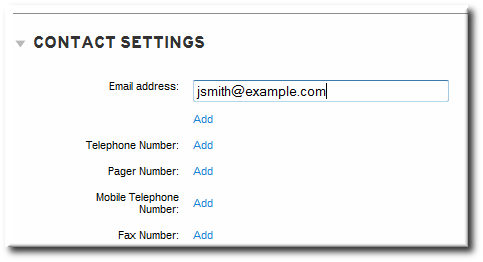 Most of the attributes in the Identity Settings and Account Settings areas have default values filled in for them, based on the user information or on the user entry template. 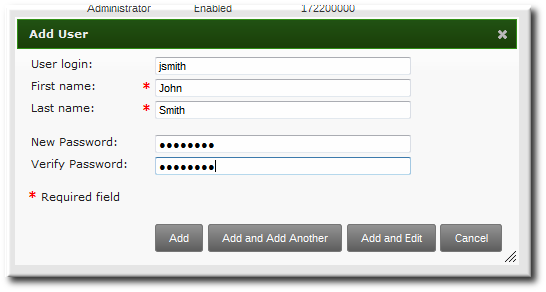 Edit the fields or, if necessary, click the Add link by an attribute to create the attribute on the entry. When the edits are done, click the Update link at the top of the page. 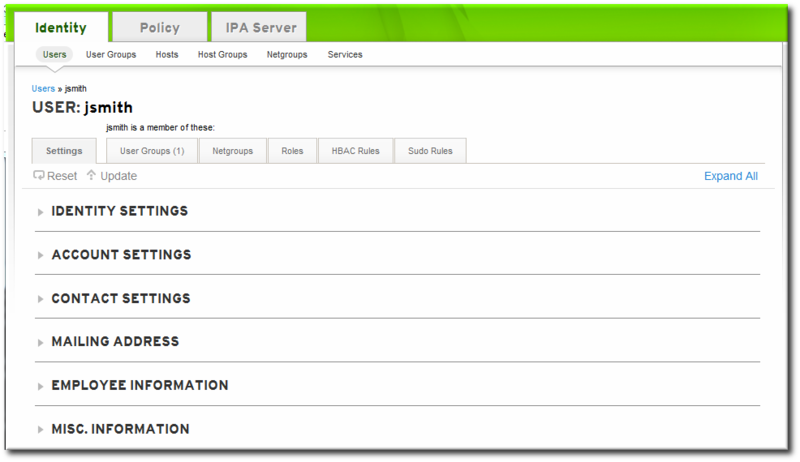 [bjensen@server ~]$ ipa user-mod jsmith --title="Editor III"
Identity Management allows multi-valued attributes, based on attributes in LDAP that are allowed to have multiple values. For example, a person may have two email addresses, one for work and one for personal, that are both stored in the mail attribute. Managing multi-valued attributes can be done using the --addattr option. If an attribute allows multiple values — like mail — simply using the command-line argument will overwrite the value with the new value. This is also true for using --setattr. However, using --addattr will add a new attribute; for a multi-valued attribute, it adds the new value in addition to any existing values. A user is created first using his work email account. Then, his personal email account is added. Both email addresses are listed for the user. Deleting a user account permanently removes the user entry and all its information from IdM, including group memberships and passwords. External configuration — like a system account and home directory — will still exist on any server or local machine where they were created, but they cannot be accessed through IdM. Deleting a user account is permanent. The information cannot be recovered; a new account must be created. If all admin users are deleted, then you must use the Directory Manager account to create a new administrative user. 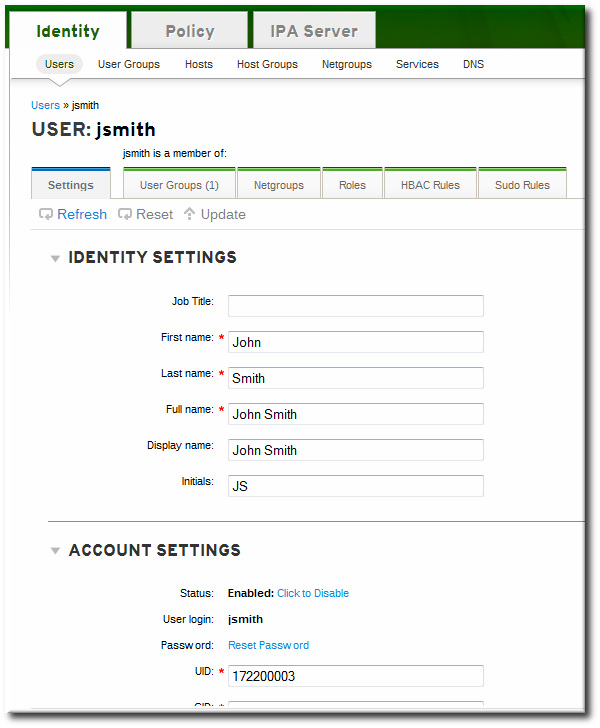 Alternatively, any user who belongs in the group management role can also add a new admin user. Select the checkboxes by the names of the users to delete. Click the Delete link at the top of the task area. When prompted, confirm the delete action. To delete multiple users, simply list the users, separated by spaces. When deleting multiple users, use the --continue option to force the command to continue regardless of errors. A summary of the successful and failed operations is printed to stdout when the command completes. If --continue is not used, then the command proceeds with deleting users until it encounters an error, and then it exits.